This one is very good....classic Rogers. The massing is well done and the spires are a nice touch for added height. I'm pleased with it. I read that 4 starts first because its the Port Authority headquarters, but they'll all pretty much be underway at the same time. I was wondering about that. I was thinking maybe it was just the rendering, but who knows? They haven't officially came out with anything on that in a while. Excellent. 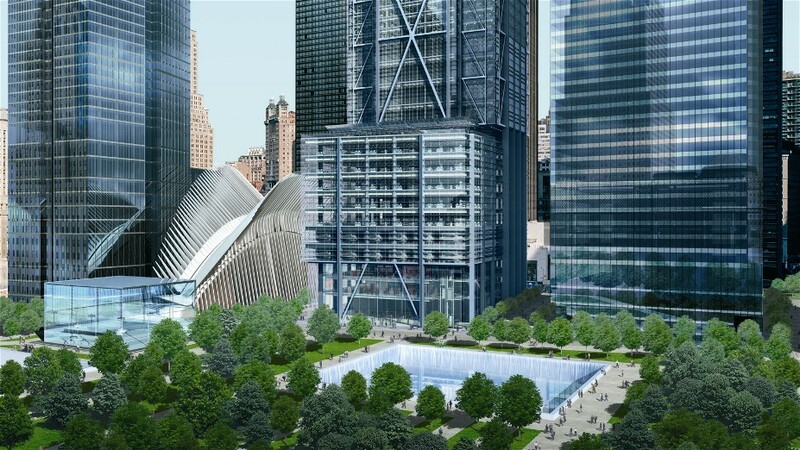 I hated the idea of a giant visitor center blocking views of the PATH station from the memorial. I say keep it as small and transparent as possible. As for 175, I think it is a fantastic rendering. It reminds me of Bloomberg in it's massing, but much sexier. What can I say, I'm a sucker for Roger's external cross-bracing. I completely agree. The last of the three NYGuy posted is now my desktop background. But are there really going to be that many vehicles whizzing by on Greenwich St? Not as nice as it seemed in yesterdays renderings but nonetheless a good job done by Rogers. The setbacks are not as dramatic as i would like them to be but i love the exoskeleton component. I wonder if those antennas are functional or just decorative masts. If they are functional maybe they can take that huge, out of place, antenna thing from Conde Nast. Conde Nast will likely stay up as a backup for WTC and ESB antennas. It reminds me of the New York Times tower being built in Midtown. I wish that THIS was the FT instead.